Heart of Dixie (Dixie) is a 15.3 1/2HH 14 year old white mare. She is a quarter horse cross showing in walk/trot, green rider and short stirrup hunter divisions. 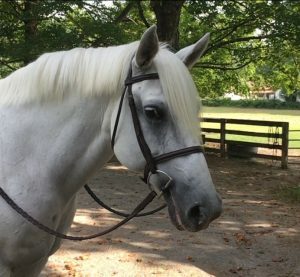 Dixie is an easy keeper, always sound, exceptional ground manners and the sweetest unflappable personality making her the best teacher for beginner riders of all ages. For show record, view USEF #5403766 and MTHJA #2458.